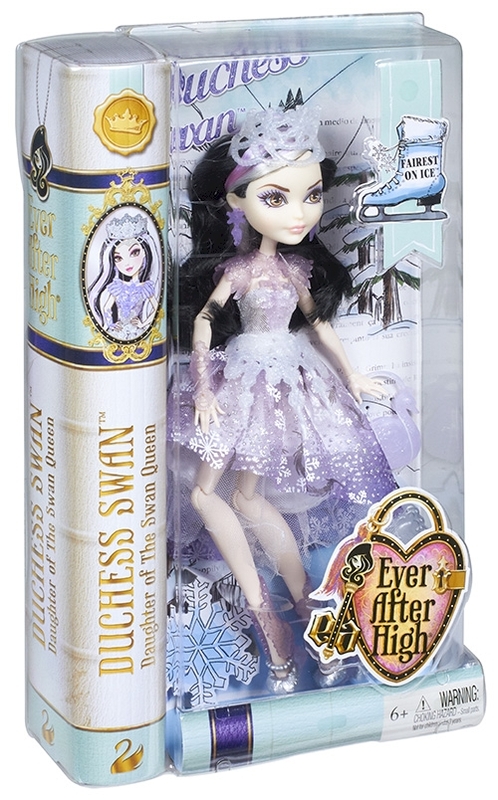 Shut the storybooks you thought you knew because at Ever After High™, you can Choose Your Own Ever After! For these teenage sons and daughters of the most famous fairytales ever, every event is epic. When first-timer Poppy O’Hair™, graceful Ashlynn Ella™ and spotlight-loving Duchess Swan™ take to the ice, their escapades turn into a real cool show. 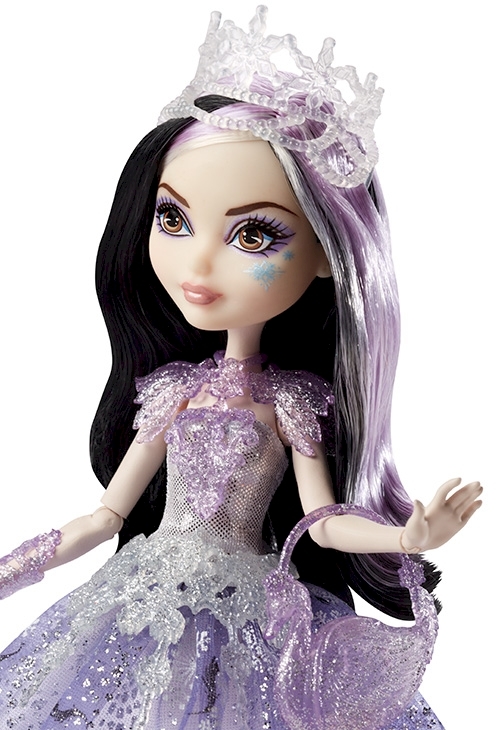 Duchess Swan™ doll, daughter of the Swan Queen from Swan Lake, looks spellbinding in a purple and white ice-inspired dress with enchanting shimmer shine throughout. Decorated with a glittery print and a cascading snowflake belt, she’s ready to steal the show. Winter-themed accessories include a snowflake headband, translucent earrings and a trendy bracelet. Purple and silver ice-skating boots show off her signature style, while a purple, translucent, swan-shaped purse incorporates fairytale influence. Girls can recreate favorite scenes from the webisodes or develop new epic plots of their own -- whether they ice skate into adventure or their own happily ever afters! A doll stand and doll hairbrush add to the play and display possibilities. Collect all of the ice skater-themed dolls to really heat things up on the ice (each sold separately)! Includes Duchess Swan™ doll wearing fashions and accessories with purse, doll stand and doll hairbrush. Doll cannot stand or skate alone. Colors and decorations may vary. Features: At Ever After High™, the teenage sons and daughters of the most famous fairytales turn tradition on its crown when they decide to Choose Their Own Ever Afters! When first-timer Poppy O’Hair™, graceful Ashlynn Ella™ and spotlight-loving Duchess Swan™ take to the ice, their escapades turn into a real cool show! 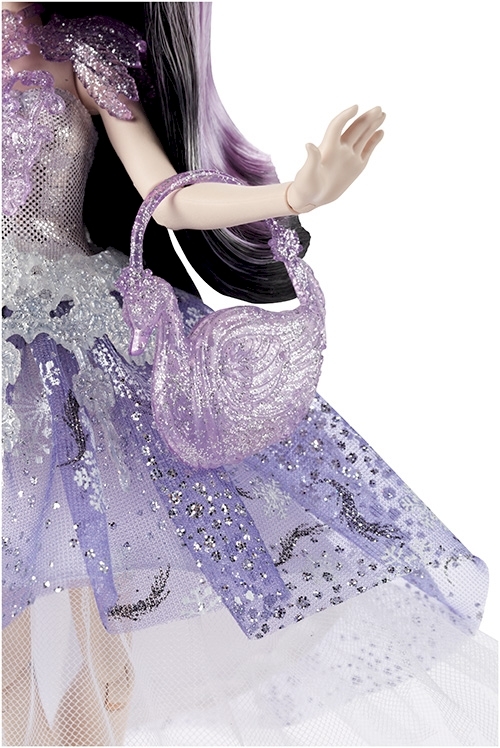 Duchess Swan™ doll looks spellbinding in a purple and white ice-inspired dress with enchanting shimmer shine and cascading snowflake belt. Winter-themed accessories include a snowflake headband, translucent earrings and a trendy bracelet. Purple and silvery ice-skating boots and a purple, translucent swan-shaped purse complete the fableous fairytale skating look. Skate into adventure or your own happily ever after! Collect them all for spellbinding display (each sold separately)! ©2014 Mattel. All Rights Reserved.